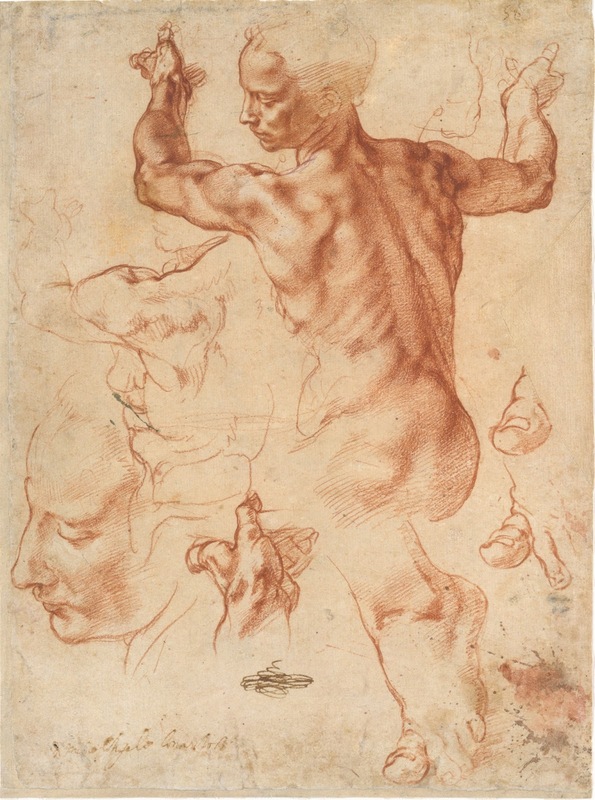 Michelangelo Buonarroti (Italian, Caprese 1475–1564 Rome). If it was ever out of fashion, the Renaissance seems to be having another big moment. Besides Michelangelo: Divine Draftsman & Designer, at the Met Museum, Walter Isaacson (who wrote Steve Jobs' riveting biography a few years back) has just published a biography of Leonardo da Vinci, who was 30 years older than Michelangelo. And Christie's is auctioning a small da Vinci painting: Salvator Mundi, ca. 1500, which was only determined to be painted by Leonardo in 2011. (Dr. Carmen Bambach, curator of the Michelangelo show, has concurred with the attribution.) The lot is dubbed "The Last Da Vinci," and is part of, oddly enough, the Post-War & Contemporary auction on November 15. Shows at the Met, such as Michelangelo: Divine Draftsman & Designer, are reminders of how lucky we are to have access to such a literal treasure trove, and to the exhibitions it has the resources to put together. 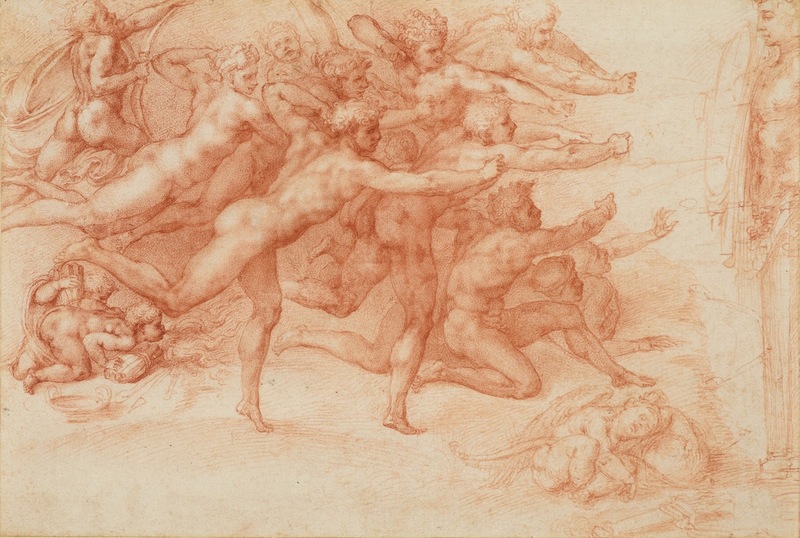 Collections tapped for the Michelangelo show range from international museums to the Queen of England's private cache.The exhibition, organized by Dr. Carmen Bambach, a curator at the Met, is primarily composed of 128 drawings, with supporting paintings and sculptures by Michelangelo, but also his mentors and colleagues. Many of the drawings are small-scale and informal in feel—the sort you might find done on a napkin or perhaps done idly while daydreaming. The imagery sometimes shares paper with handwritten notes, or can occupy both sides of a sheet of paper. Of course, there are larger, more formal drawings as well. But part of the charm of the exhibition is this focus on process, on lively renditions of parts that unite to compose a larger whole. Michelangelo Buonarroti. Italian, Caprese 1475–1564 Rome. A major focus of the show is an illuminated reproduction of the Sistine Chapel ceiling. Below it are displayed studies for figures in the mural, with a key showing the corresponding finished part above on a small, gridded diagram. It is a thrill to see up close the sketch of the two hands reaching toward one another in The Last Judgment. 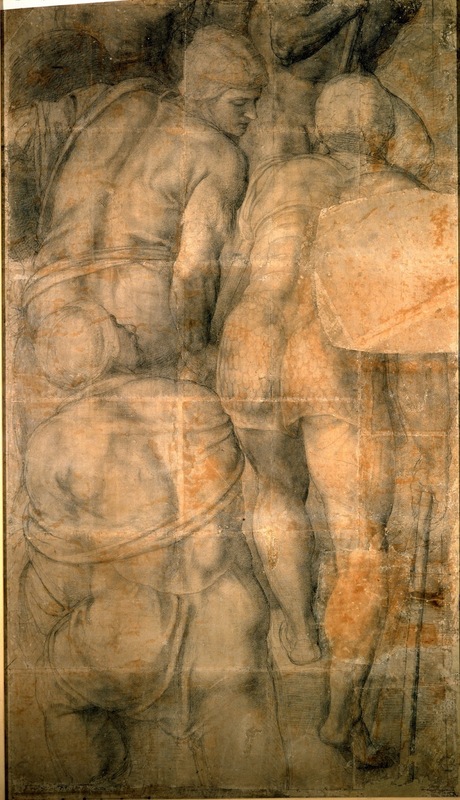 As a teen, Michelangelo studied with Ghirlandaio, who also has several works on display at the Met. The most engaging compositions are not formal ones, such as portraits either full-length or cameo—but bodies in motion: twisting, pulling, advancing. A large drawing, Cartoon with a Group of Soldiers for the Crucifixion of St. Peter, shows a mass of bodies from the back. You feel like you're amid the scrum of men surging forward. I coincidentally just read the novel The Improbability of Love, by Hannah Rothschild, which revolves around a small (fictional) painting by Antoine Watteau that finds its way to a junk shop and is bought for a song by a young woman. The painting holds a deep, dark secret which is revealed throughout the book. It is eventually put up for auction, and along the way captivates numerous prospective bidders as a priceless symbol of pure love. While the central artwork derives from the Rococo period, it's another story of the power of art to endure through time, making immortal human emotions and artistry. The story of the Leonardo up for auction now seems like the perfect fodder for a novel about the timelessness of art. And yet it's real, another episode in the painting's sixth century on earth. On it goes as we watch for a brief time.